In the previous demo you have seen that Excel has a powerful feature to visualize and study data: the Quick Analysis tool. 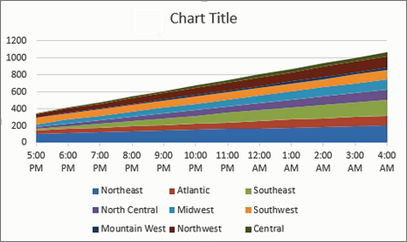 If you want more advanced options to visualize data, Excel has many more chart options to select from. It is all up to you how you want to see or study your data. In this demo in the Excel 2016 from Scratch series, Peter Kalmstrom shows another way to visualize, when he explains how to create a stacked area chart and add sparklines in cells. How to insert a new graph for the selected data in an Excel sheet. How to visualize data in different graphs. How the chart and sparklines change when data changes.